There is no such thing as a bargain when it comes to bird seed. I learned this the hard way. Maybe everybody loves Raymond, but I promise you: Nobody loves Milo. 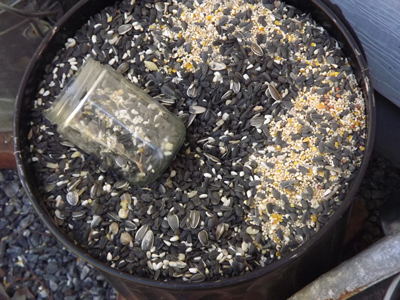 I noticed over the last season that different seeds attract different birds. When I switched from the top-of-the-line mix that contained mostly black-oil sunflower seeds, safflower, and peanut chips, my feeder was graced with a variety of birds, including cardinals, jays, nuthatches, finches, chickadees, and woodpeckers. Enter the recession, and I switched to a bargain brand. 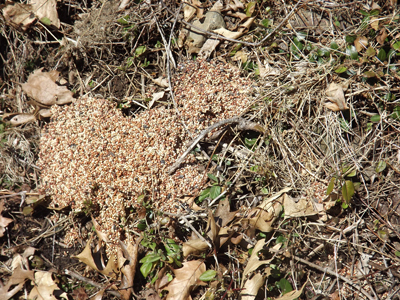 I noticed that my feeder was now busiest at the base, with ground feeders like sparrows and juncoes that hopped about the spilled millet. And, as I noted earlier, the round red milo was both spilled and untouched. I tried another economical mix from BJ’s, and found to my dismay that it contained mostly corn. Enter the grackles and starlings. My feeder looked like the B-version of “The Birds,” with these smaller blackbirds pushing out every other species. So off I went to a small store in the neighboring town: “Feed the Birds!” in Croton-on-Hudson. I had a nice chat with the owner, who sold me a blend called “Backyard Best” and a sack of nyjer seed (more on that later). You can easily tell the not-much-of-a-bargain brand: It's mostly corn. The better brand is black-oil sunflower, safflower, and peanut chips. The layers are visible -- a bird seed parfait! Now to the nyjer. 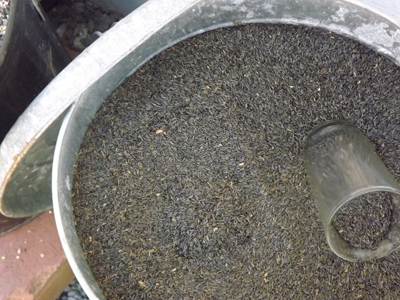 This seed, often called thistle seed, is beloved by gold finches (which are beloved by me). Spring is coming, and one of my favorite harbingers of the season is to watch the finches arrive in their olive-drab winter garb, and leave wearing their finest bright yellow plumage. Little drops of cheer at the feeder — I love them! But my nyjer feeder was a mess — cracked, damp, and musty. I took it down, undid all of the screws, removed the perches, and scrubbed it clean. 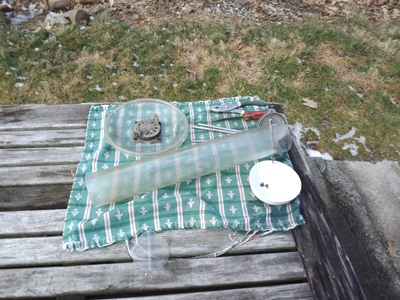 Disassembled, and drying in the brisk February wind. Beautiful stuff, and I always feel rich when the buckets are full! I cannot wait to see who comes to visit, and I’m feeling a bit better about my credentials as Hostess. I am laying out a bountiful table, of elegantly slim nyjer, bitter-and-discriminating safflower, and robust black-oil sunflower. Dinner is served! Gorgeous birds, but so aggressive! “How are your feeders arranged? Are they near your windows? Blue jays love shiny surfaces and tend to dominate feeders that are affixed to or near windows. They also prefer feeders that are platform and don’t require them to cling or hang upside down to retrieve the contents. The type of food is also relevant. Jays tend to go after peanuts, in and out of shell, sunflower seeds, and any type of fruit. Also if you have sunflowers growing in your yard, blue jays are attracted to those. Anything designed to deter jays will ultimately deter other birds as well. If you can’t beat them, join them. 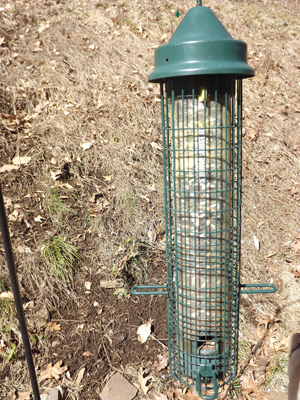 Put up a feeder with peanuts in shell, just for the jays, in a completely different spot than all your other feeders. Personally? I’m liking that idea of a separate feeder with peanuts-in-the-shell. I can’t do that at my house, because my husband would be out there constantly, and the jays would go hungry, but maybe it could help at your house?! 2.) 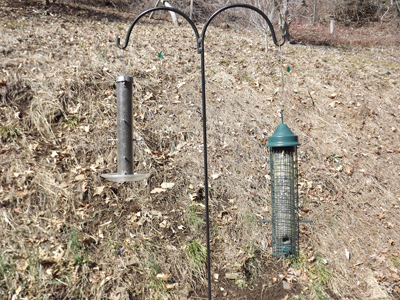 Set up a platform-type feeder with whole peanuts on them away from the other feeders. BlueJays love whole peanuts more than anything. I’m sensing a trend here — whole peanuts, far far away from your other feeders! That’s an intriguing question, Sue, and I will see what I can find out for you! First stop: emailing the owner at “Feed the Birds”! I will report back….. Excellent post! I had a bunch of cheap, junky birdseed go to waste. The birds wouldn’t touch it and all it did was cause weeds to sprout. I have several different feeds all over my yard. The birds really bring us a great deal of joy (and entertain the cats on the other side of the windows!). Interested to know what types of birds you typically get in your area. Share? Oh, the squirrels — a problem here, too! My current feeder is somehow positioned perfectly, and they don’t have a launching site to leap through the air onto our feeder. So they must be content with feeding on the ground along with the sparrows and juncoes. I’m sure the squirrels feel the company is undesirable, but I’ve noticed their high opinion of themselves is set aside when it comes to food! Agree, effort should always be rewarded!